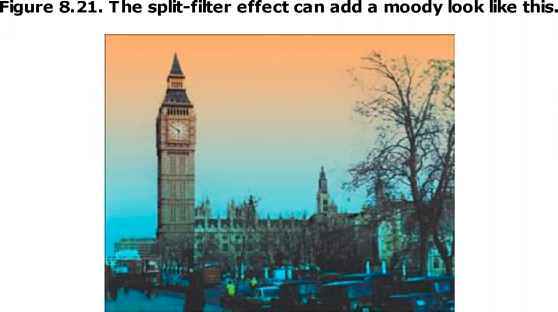 Next, you'll use the ZigZag filter to create the impression that you're viewing the reflection of a dandelion on the surface of a rippled pool of water. 1 In the Layers palette, select the Dandelion layer. 2 Choose Filter > Distort > ZigZag. 3 At the bottom of the ZigZag dialog box, make sure that Pond Ripples is selected in the Style pop-up menu. Then experiment with different settings for Amount and Ridges by dragging the sliders. (The example uses 10% for Amount and 11 for Ridges.) When you are satisfied with the result, click OK.
• To cancel a filter as it is being applied, press Esc or Command-(.) (period) (Mac OS). • To undo a filter, press Ctrl+Z (Windows) or Command+Z (Mac OS). • To reapply the most recently used filter with its last values, press Ctrl+F (Windows) or Command+F (Mac OS). • To display the dialog box for the last filter you applied, press Ctrl+Alt+F (Windows) or Command+Option+F (Mac OS).